Boxing is a sport that is funny in many ways. It is brutal and sometimes deadly but it brings out many stories from the good, the bad and the ugly. Take for example a young fighter from Davao, Genisis Libranza from the Manny Pacquiao Promotions via Nonoy Neri’s Boxing Stable. 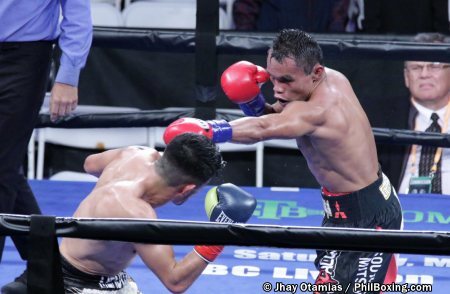 Libranza showed a lot of promise with his multiple victories in the Philippines. 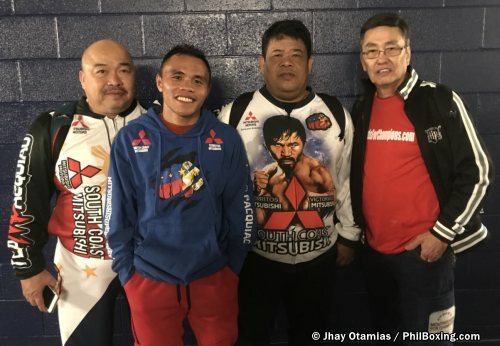 The Manny Pacquiao Promotions recognized his talents and his potentials and he was signed up to fight on the undercard of the Pacquiao-Broner extravaganza in Las Vegas last month. Of course it did hurt that his trainer is Nonoy Neri, one of Pacquiao’s trusted assistants. But Libranza was not able to fight as scheduled. His opponent was not professional enough to make the contracted weight limit and the fight was cancelled. The cancellation was a huge hit on Libranza’s pockets. In boxing, except in certain instances, if you don’t fight, you don’t get paid. Since it was not Libranza’s fault that his scheduled fight was cancelled, Sean Gibbons, the awesome Las Vegas-based matchmaker, and Joe Ramos, the COO of the MP Promotions, went over their heads and got him a new fight schedule. Gibbons’ and Ramos’ connection to the FMJ Promotions made the fight easy to arrange. 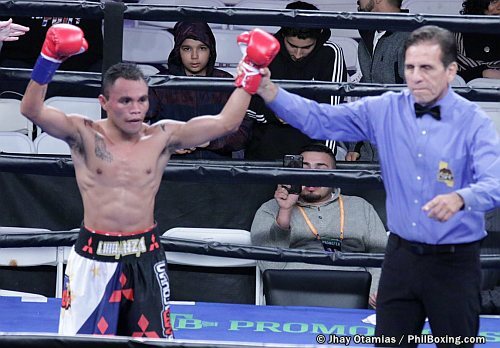 So Libranza was booked on the 18 fight-card event put up by The FMJ Promotions and Premier Boxing Champions on ShowTime Boxing, February 9, 2019 on the undercard of the Gervonta Davis vs. Hugo Ruiz WBA junior lightweight title fight. That was the good part! The initial fight card schedule indicated that Libranza was supposed to be on the number 2 spot in the fight card. But those that run the show had other ideas to fit their needs and perhaps, television. So instead of Libranza fighting on the number 2 spot on the fight card, he was relegated to number 17, after the main event and all the televised fights were over. That was the bad part. Had Libranza fought on his original spot, the temperature at the Dignity Health Sports Center would have been around 65 degrees and sunny this time of the year. His fight would have been around 3:30 PM. That would have helped a bit in the warm up at the dugout. Of course, it would also have been great at the ring area. By the time Libranza finally made it to the ring to face Gilberto Martinez, it was way past 9 PM and the temperature dropped to the high 40’s. That was the ugly part. It was a great thing that Libranza was not hugely affected by the cold temperature. This can be credited to the fact that Coach Nonoy Neri and Ting Arriosa prepared him well during the warm up in the dugout. Therefore, when he stepped into the ring, he was well warmed up and ready to go. The 8-round fight was far from a walk in the park. It was tough as a fight can get. 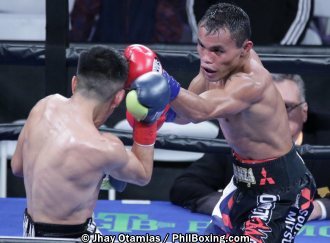 Libranza had to dig deep inside and used on all his experiences to earn a very close unanimous decision. After the fight, he informed me that he was surprised by the way his opponent fought. “He fought so different from all his “youtube” fights I have seen. He was supposed to be an aggressor and our plans were to counter, but it turned out the other way around. I had to adjust mid fight and luckily, I was able to get the win,” he said. Well for Libranza, a win is a win no matter how it came about. “Hopefully Senator Pacquiao will recognize my efforts tonight and he will give me more fights in the future,” he added. With his win tonight, I have no doubt Gibbons and Ramos will find it easy to schedule him again. The guy gave it all and he needs to be credited for his great effort.